Looking for stocks with high upside potential? Just follow the big players within the hedge fund industry. Why should you do so? Let’s take a brief look at what statistics have to say about hedge funds’ stock picking abilities to illustrate. The Standard and Poor’s 500 Index returned approximately 13.1% in the 2.5 months of 2019 (including dividend payments). Conversely, hedge funds’ 15 preferred S&P 500 stocks generated a return of 19.7% during the same period, with 93% of these stock picks outperforming the broader market benchmark. Coincidence? It might happen to be so, but it is unlikely. Our research covering the last 18 years indicates that hedge funds’ stock picks generate superior risk-adjusted returns. That’s why we believe it is wise to check hedge fund activity before you invest your time or your savings on a stock like National Retail Properties, Inc. (NYSE:NNN). Is National Retail Properties, Inc. (NYSE:NNN) the right pick for your portfolio? Prominent investors are becoming more confident. The number of bullish hedge fund bets advanced by 4 lately. Our calculations also showed that NNN isn’t among the 30 most popular stocks among hedge funds. 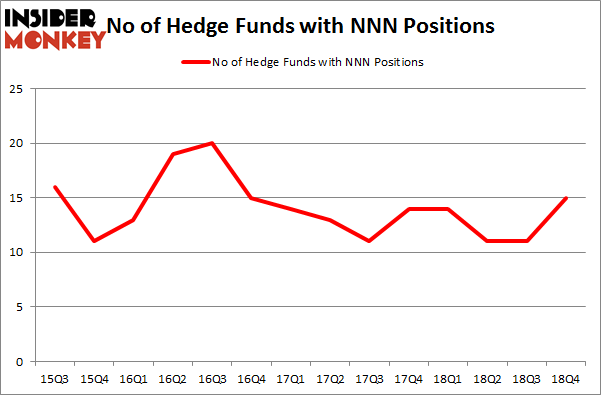 NNN was in 15 hedge funds’ portfolios at the end of December. There were 11 hedge funds in our database with NNN holdings at the end of the previous quarter. Let’s check out the latest hedge fund action regarding National Retail Properties, Inc. (NYSE:NNN). At Q4’s end, a total of 15 of the hedge funds tracked by Insider Monkey were long this stock, a change of 36% from the previous quarter. On the other hand, there were a total of 14 hedge funds with a bullish position in NNN a year ago. So, let’s examine which hedge funds were among the top holders of the stock and which hedge funds were making big moves. More specifically, Zimmer Partners was the largest shareholder of National Retail Properties, Inc. (NYSE:NNN), with a stake worth $65.5 million reported as of the end of September. Trailing Zimmer Partners was AEW Capital Management, which amassed a stake valued at $52.2 million. Millennium Management, Fisher Asset Management, and Balyasny Asset Management were also very fond of the stock, giving the stock large weights in their portfolios. Now, some big names were breaking ground themselves. Zimmer Partners, managed by Stuart J. Zimmer, created the biggest position in National Retail Properties, Inc. (NYSE:NNN). Zimmer Partners had $65.5 million invested in the company at the end of the quarter. Dmitry Balyasny’s Balyasny Asset Management also initiated a $22.7 million position during the quarter. 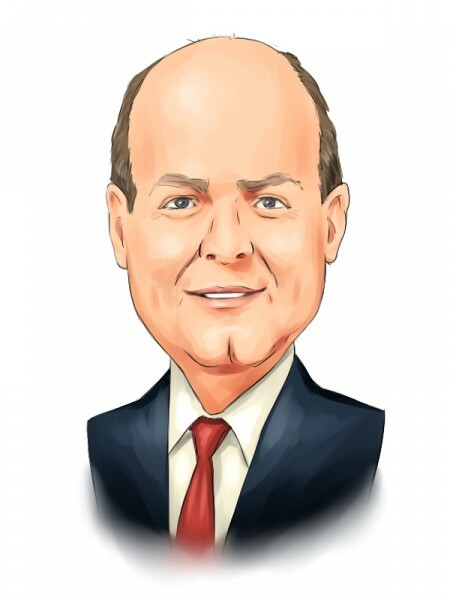 The other funds with brand new NNN positions are Jim Simons’s Renaissance Technologies, Michael Kharitonov and Jon David McAuliffe’s Voleon Capital, and Matthew Tewksbury’s Stevens Capital Management. Let’s check out hedge fund activity in other stocks – not necessarily in the same industry as National Retail Properties, Inc. (NYSE:NNN) but similarly valued. These stocks are The Ultimate Software Group, Inc. (NASDAQ:ULTI), Spirit AeroSystems Holdings, Inc. (NYSE:SPR), FactSet Research Systems Inc. (NYSE:FDS), and VICI Properties Inc. (NYSE:VICI). This group of stocks’ market valuations are similar to NNN’s market valuation. As you can see these stocks had an average of 27.5 hedge funds with bullish positions and the average amount invested in these stocks was $1259 million. That figure was $263 million in NNN’s case. VICI Properties Inc. (NYSE:VICI) is the most popular stock in this table. On the other hand The Ultimate Software Group, Inc. (NASDAQ:ULTI) is the least popular one with only 20 bullish hedge fund positions. Compared to these stocks National Retail Properties, Inc. (NYSE:NNN) is even less popular than ULTI. Considering that hedge funds aren’t fond of this stock in relation to other companies analyzed in this article, it may be a good idea to analyze it in detail and understand why the smart money isn’t behind this stock. This isn’t necessarily bad news. Although it is possible that hedge funds may think the stock is overpriced and view the stock as a short candidate, they may not be very familiar with the bullish thesis. Our calculations showed that top 15 most popular stocks among hedge funds returned 21.3% through April 8th and outperformed the S&P 500 ETF (SPY) by more than 5 percentage points. Unfortunately NNN wasn’t in this group. Hedge funds that bet on NNN were disappointed as the stock returned 11.5% and underperformed the market. If you are interested in investing in large cap stocks, you should check out the top 15 hedge fund stocks as 12 of these outperformed the market.